Playing by yourself can sometimes be boring. In Arithmetic Village, even though everyone has their own job, they also work together. Learning together. 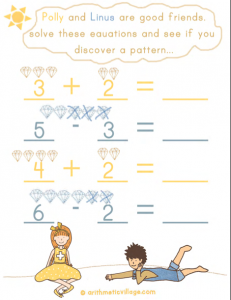 This little activity with Polly and Linus shows that the more you know about addition, the more you know about subtraction. Patterns are important! Math is beautiful. See if your mathematician can spot the patterns themselves! Edit.. This is Week 48 not 47!!! (Where has this year gone? !